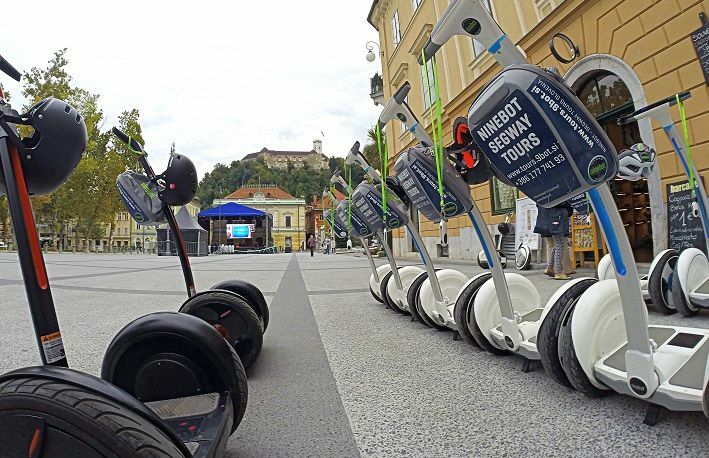 Take a guided segway tour of Ljubljana and glide through the area around the city centre, along the Ljubljanica river embankments, and through the city's most beautiful park, Tivoli, on board a Ninebot personal transporter. Electric powered personal transporters are a popular mode of sustainable city transport and you will quickly learn how to ride them after being given short instructions. Your guide will then take you through a number of picturesque parts of Ljubljana that are not included in the majority of other city tours, so get ready for an exciting exploration! The tour includes short instructions on how to ride a personal transporter, a personal transporter ride, and city tour guidance by a qualified guide. 1 April - 31 October 2017: by prior appointment. The tour requires a minimum of one participant to operate. The maximum number of participants is eight. Slovenian, English, German, Spanish, Italian, French, Russian, Chinese, Croatian. The tour is available to people whose body weight exceeds 40 kilograms. The tour is subject to cancellation due to weather conditions. Have you ever wandered around your home town and noticed a tourist staring at some building, making tons of photos? Did you ever stop and try to figure it out, what so interesting is? We do that a lot and we are always surprised how fast we become unaware to all the beautiful scenes around us, when being home and take everything for granted.